I'm planning a full blog/video at some point on zeroing the AR-15 rifle. There is a little strategy to it, as it involves understanding some principles of ballistics that you ordinarily don't have to worry about when you are zeroing your standard bolt action rifle or Ruger 10/22. The trajectory of the AR-15's projectile is unique in that it will usually cross the point of aim twice, once when the projectile rises and then again as it falls toward the earth. This unique characteristic is made possible because of the height of the sight over the bore, usually around 2.5 to 3 inches for various optics and iron sights. 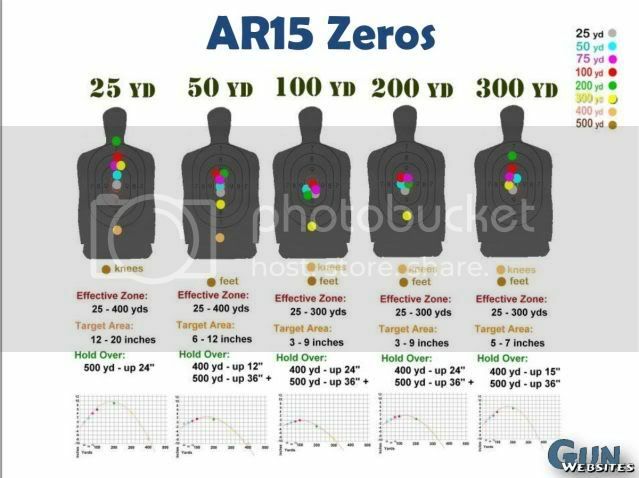 After thinking I understood all there was to know about optimal AR-15 zeroes, my thinking evolved again. More after the jump about why I now use the 100m zero exclusively. First let me get some acknowledgements out of the way. A big thanks to Jack Leuba from F2S Consulting for explaining this in a way that even I could understand. Give them a look if you are thinking about training at www.F2SConsulting.com . Since I began shooting AR-15 rifles, I had always utilized the 50m zero on irons and red dot optics (or yards, for the purpose of discussion, meters and yards will be interchangeable in this post). The 50m zero will also return to the point of aim somewhere around 200m. A true 200m zero should be obtained by shooting a target at 200m, not 50. That does however involve much more effort. The 50/200m zero has the advantage of being no further than 2-3 inches away from your point of aim for almost any distance under 300 yards. This makes this zero a very effective "battle zero" for close engagements, and carbine competitions as well. The downside, is that you mentally have to know the trajectory of the bullet at different distances and be familiar with your holdoffs. If you are required to hit a small target at 100 yards, then you have to know your precise holdoff, as the bullet will be high at this distance. 1. The trajectory of the projectile is flatter and never rises above the point of aim. As the bullet leaves the muzzle, it is 2 3/4 inches below the point of aim and rises slowly until it strikes the target at 100 yards. The relative same point of aim/ point of impact will be maintained from 50-175 m using this method. The bullet will stay within a 3 inch circle from 0-200m even if the shooter continues aiming directly at their target with no holdoff. Getting hits on torso sized targets at longer distances is easy as well, as for 300m shots one must just aim at the head to hit the chest. 2. Using this method, there is no requirement to remember holdoffs for different distances. If a shooter accepts 3 inch variability as adequate, then the aiming point never changes. The same cannot be said for the 50/200m zero. 3. For shooting distances longer than 200m, the shooter must only use holdoffs above the target to compensate for bullet drop. There are no scenarios for which the shooter would need to use a holdoff below the target. This simplifies holdoffs tremendously and as Jack says, "takes all the slop out of adjustments". Realistically, shooting distances farther than 300m with non-magnified optics or iron sights is going to be rather difficult regardless. This zero primarily shines at close distances. To see the full discussion with further pictorial descriptions, go to the thread on M4carbine.net . As with anything in the shooting sports, perfection takes practice. Regardless of which zero you choose to utilize on your rifle, spending some time evaluating how the rifle performs at different distances is highly recommended. After some time, aiming and holdoffs for longer distances will become second nature. It is of course possible to be perfectly functional using the 200 or 300m zeroes on an AR15, however, I have now found the 100m zero to be superior for me. I hope this discussion has opened your eyes to some of its advantages and perhaps can take your shooting to a new level. If you are a 3 gun competitor or law enforcement guy in particular (who's engagements will all likely be close quarters) the 100m zero is perfect for you. Try it out next time you are out at the range and see what happens.